As a public service, for information purposes only, here’s a nifty graphic on the subject of college costs. No fee has been paid for publishing the graphic, and no endorsement of the information or source is implied. No endorsement of any institution named below is intended. Share this post with friends and family. Student debt that burdens recent college graduates, as well as those who will graduate this spring and in years to come. Sky-high and still rising college costs. That includes tuition, fees, room and board. Sen. Elizabeth Warren and two dozen other senators are taking the lead on the debt part of the equation. Sen. Warren and others introduced yesterday the Bank on Students Emergency Loan Refinancing Act, a bill that would allow borrowers to refinance student loans to a lower interest rate. 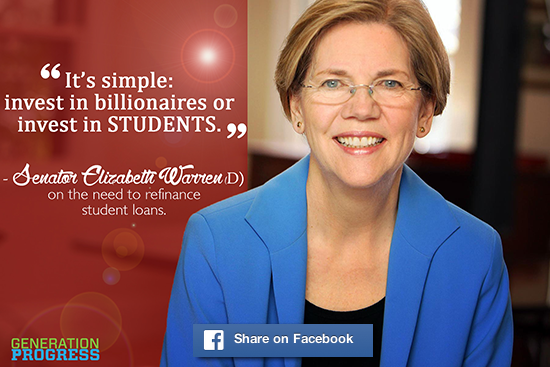 This bill, if it passes, will not solve the student debt crisis, but it would be a start. As long as the cost of going to college remains prohibitively high, we’re constantly creating more student debt. Maryland’s three gubernatorial candidates have all addressed the issue, but feebly. Simply slowing the rate of increase in the cost of college is not exactly a solution. As long as college costs are high, the debt problem will keep getting worse. Seems to me the real answer is something more radical. Like start reducing the cost of tuition, or providing much more means-based student aid. You want a really radical idea? Free college tuition. It’s been done before. It should be tried again. We could start on a limited basis, for instance free tuition at Maryland community colleges for any student graduating in the top 25 percent of any high school class in Maryland. That’s just one possibility to illustrate the concept. The fundamental idea is, we’ve got to make college affordable again for middle-class and working-class students. Otherwise, more and more students are going to pass on college because it’s just too expensive. That decision might limit them for the rest of their lives, and it will definitely inhibit the growth and competitiveness of the American economy. Not everyone needs to or wants to go to college. But everyone who has the ability and the desire to do college work should have the opportunity. Everyone knows about credit card debt and mortgage issues, but the significance of student debt is still emerging. Higher education student debt should be at the top of the list of issues addressed by Democratic candidates in this year’s elections. Recent graduates (and also students who studied for several years but didn’t graduate) are well aware of the problem, and they could use some help. The burden of student debt might not be so bad, if more and better jobs were available for young adults. But the fact is, graduates face a stagnant job market and declining wages. How do you pay off student debt and start a family on Walmart wages? 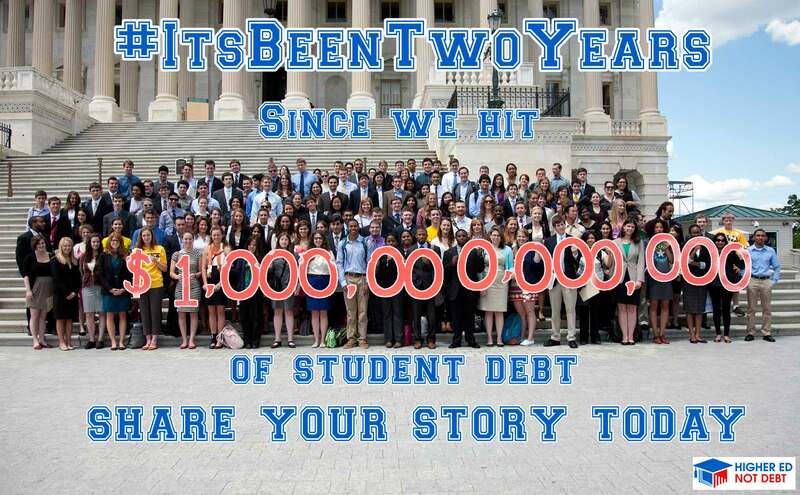 Higher Ed Not Debt is organizing events across the country to put the spotlight on student debt. For more information see the Higher Ed Not Debt website. See that line? That’s the first-day of early voting at Berlin in Worcester County, Maryland. You can expect long lines at Maryland polling places for the Presidential Election on Tuesday. The reason: Ballot questions that voters know are important, so they take the time to read all the questions in the voting booth and make their decisions. The solution: Get familiar with the ballot questions before you go to vote. Do this on Sunday or Monday. Make your decisions and mark them on your sample ballot or just jot them down on a scrap of paper. Or print out this post and take it with you. Walk into the polling booth, vote, and you’re out in three minutes. But you’ll still have to stand in line, because most people won’t take a few minutes to prepare themselves in advance. The following comments on four of the ballot questions represent the opinions of the blogger. QUESTION 4, REFERENDUM: HIGHER EDUCATION, TUITION RATES. Quick recommendation: QUESTION 4: VOTE FOR THE QUESTION. Question 4 is the in-state tuition referendum, AKA the Dream Act referendum. Authorizes in-state and in-county tuition rates for all true residents of Maryland, including undocumented immigrants. It’s been passed by both houses of the General Assembly after considerable debate, and signed into law by the governor. SUBSCRIBE BY EMAIL. Everyone's doing it. No trees will be killed. I'm nearly seventy and keeping life simple, somewhere on the Gulf Coast of Florida. Do not drive or operate power tools until you know how this blog affects you. Noah's Compass, By Anne Tyler A book review in four parts. It's an easy game. "Do What You Love, The Money Will Follow"
© Bernard John Hayden 2009, 2010, 2011, 2012, 2013, 2014, 2015, 2016, 2017, 2018. All rights reserved. Unauthorized use of this material is prohibited. Excerpts and links may be used, provided credit is given.